Viewing a thread - the 60 New Yorker arrived this morning. the 60 New Yorker arrived this morning. Subject: the 60 New Yorker arrived this morning. Location: Victoria, BC, on Vancouver Island, Canada The car belongs to member here, Islander_62 a friend of mine here in Victoria, BC. It arrived here in Victoria around 2 AM this morning, just came in from the Seattle area, not too far away from here. It's getting ready to be dropped off in a storage unit until such time as the sized engine can be looked at. Nobody knows the story behind the seized engine. However the car is absolutely incredibly original with only 40,000 miles. Mint upholstery, needs a good detailing and cleaning inside and out. Mostly original paint by the look of it. The original trunk carpet and panels are near mint. I'm posting these photos for Chris (Islander_62). He'll probably chime in later on after he gets the car settled in. Subject: RE: the 60 New Yorker arrived this morning. Location: Lower Mainland BC Ian: Tell Chris congrats. Lucky B@shtard. Must be petal pink (??) 350 hp 413!! Yikes. Location: Victoria, BC, on Vancouver Island, Canada Yup, Petal Pink is the factory color. A few things were discovered with the car: Original Window Sticker, a sleeve over the Driver's Visor stating that the manual seat can be adjusted for height and tilt at the dealer for no charge, and there is an OEM MoPar tube the size of a lipstick tube, of Petal Pink touch up paint in the glove box. Also the original Service Maintenance booklet and Owner's Manual. Original Spare tire still in the trunk too. The interior color is Terra-Cotta. The OEM carpet in the car is very thick luxurious cut pile. Windsors and Saratogas got loop carpet. Chris bought the car in late November, then at some point had it towed to Jon Carson's Fenders and Fins in Woodinville where it had a dent repaired, got the tires installed and a cleanup. A big thanks goes to Jon. It got picked up at Jon's on Friday morning, and came over the border into BC on Friday afternoon. I'm sure Chris will be chiming in on this with some thoughts. Location: Parts Unknown Very elegant in those colors. with the angular fins and boomerang tail lights. Location: Central Alberta What a neat car! That interior is gorgeous, great find for your friend, congrats! What a neat car! That interior is gorgeous, great find for your friend, congrats! Gosh.....I didn't think my '60 would cause such a stir. It really is nice though, and finding one in this condition is outhouse luck.....It's a tad under the condition of my '61 Saratoga...yup...Saratoga, because it was made here in Canada. We just brought the New Yorker home to Vancouver Island yesterday and have it safely tucked away. Now down to the reason it came so cheap....the engine room is a mess...the 413 is seized....and it looks like the battery may have exploded way back when......who knows at this point...whoever started work on it so many years ago had no idea what they were doing. the plugs have been out of the engine at least twenty years and the oil filter and pressure sender are out as well. But....as everyone knows it's a lot easier to go through a drive train than it is to do body and upholstery etc.....and far less expensive. In the WPC club here on the Island we have two fifty plus years experienced Mopar mechanics...one of whom holds some performance records from his racing days. He's looking forward to hauling the 413 out and going through it...the Torque Flite fluid looks and smells OK but we're going to do it regardless....the car came with a Sure Grip which we'll inspect and service. Location: Victoria, BC, on Vancouver Island, Canada Now that Chris has let the engine room secret out, well, here it is in all its devastating glory. Location: Victoria, BC, on Vancouver Island, Canada Among other things, the original window sticker was with the car. Location: Victoria, BC, on Vancouver Island, Canada trunk showing the original carpet and panels in good shape. Location: Southern Sweden - Sturkö island This is indeed a very nice car - I've never seen a Lucite steering wheel in that condition un-restored. The dash pad looks to be ok as well. Clearly, the owner cared a lot for his car and keept it all in order until something happened with the battery/Engine. Location: North Australia Nice looking New Yorker. Congrats on a great find. I say build a long ram engine for it. That would top it off nice! Location: Southern Sweden - Sturkö island I just noticed that the car has the very rare waste basket - many cars had them, but due to the somewhat too big dimensions, they usually was kicked to pieces over the years. remained so nice. Glad to she that she'll be returning to the streets, though. Keep us updated on your progress with her. Location: Houston Looks like the engine was stored under water....? its whole life and only left the engine out in the rain ! Location: DFW, TX It looks like the battery exploded, and the acid ate away at everything underhood. An ugly mess for sure, but it left the rest of the car in pristine shape. I'd say it's worth fixing. This is indeed a very nice car - I've never seen a Lucite steering wheel in that condition un-restored. The dash pad looks to be ok as well. Sven, the 1961 Saratoga that Chris owns has an original steering wheel as nice as the one in the New Yorker, and a perfect dash pad as well. This is the 61 Saratoga, below. Location: Victoria, BC, on Vancouver Island, Canada These original registration documents were also with the car, incredibly. The car has a very late build date of July 1960. 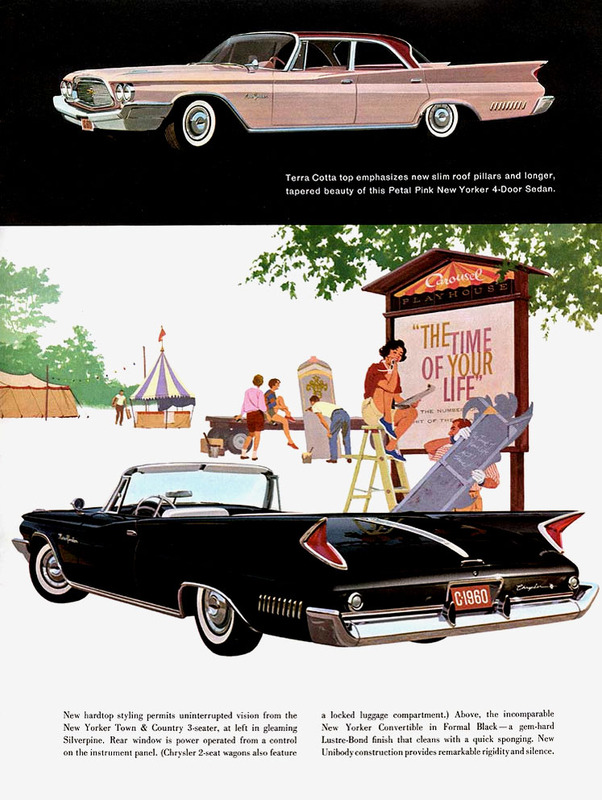 Notice that the Chrysler Registration card shows a start date of Sept 8, 1960 and an expiration of Sept 30, 1961. This car obviously sat around for a long time before it was sold. The Motor Vehicle Registration Certificate for Ono Yosh shows date of issue April 19th, 1961, assuming that this is the date it was sold / registered to the first owner, Ono, Yosh. I would imagine that Mr. Ono got a very good deal on the car being that it was now over a year old unsold inventory. Location: Victoria, BC, on Vancouver Island, Canada Found the Obituary of the original owner, Yoshikatsu "Yosh" Ono as shown in the above registration document. Location: Victoria, BC, on Vancouver Island, Canada The car also has an unusual after-market radio. On the Window sticker, one line is xxxxxx'd out that shows "Golden Tone Radio" as an option. Obviously for some reason, on the assembly line it was scheduled as part of the build but didn't get installed for unknown reasons. We assume the dealer installed this one, as well as the MoPar power antenna that is on the car. This radio differs from the factory radio with plain chrome buttons, has DeSoto style tuning knobs, and the facia is the same as the dash and radio facia in a 1961 Chrysler. Location: Victoria, BC, on Vancouver Island, Canada If you look closely at the picture of the Window sticker noticing that the Golden Tone Radio was xxxxxx'd out and you can basically see the cost was $185.00. The last line on the sheet says "Destination Charge" $185.00 and has obviously been hand typed on the sheet. The rest of the sheet was computer generated. A shady bit of work by the dealer it seems, because the total price at the bottom remained unchanged from before the radio was xxxx'd out. Location: Echuca Wow what an awesome buy, congratulations engine bay aside this is well worth the money, I will keep hunting having missed this! Location: Parts Unknown This car has the 318 Leaping Lion engine, right ? This car has the 318 Leaping Lion engine, right ? A wonderful car for sure. What I wonder is just the condition of the engine. Battery explosion, might be. But what I wonder is why just the engine (not the hole), but no signs at all at the hood, both inner fenders, radiator support. If you've ever have a battery explosion - drain as much of water as you can. Afterwards wash with a brush and baking soda/water mixture or just soap solution (normal soap is almost all the time alcaline) to neutralize the acid. Hello Doc, I'm Chris, the guy who has this '60 NY. 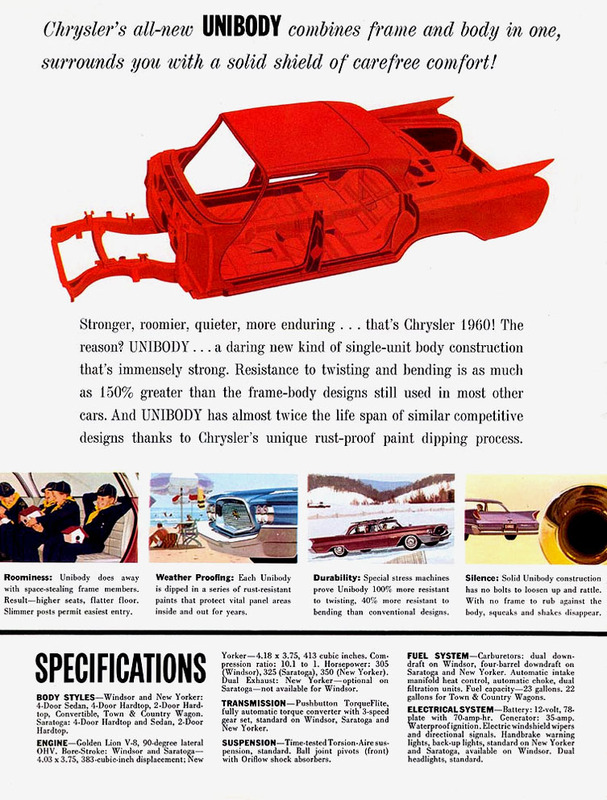 When I read the ad for the '61 I wondered who did the proof read....really and truly, folks should do their homework before they put it in print. As for my car, you know what it has, the Sleeping Lion 123 or less.....this one is so seized, the plugs have been out for at least 20 years and we suspect that it may have spun a bearing or two.....not a drop of oil in it. Hello Dieter, I'm Chris, the owner of this messy engine. Yes, the inner fenders don't look too bad. The drivers side behind the battery is down to the bare metal in a small area and the brake booster has spotty blisters. The hood escaped most of the acid because of the insulating pad that was there. It has crumbled and a lot of the fibre insulation fell onto the engine and surrounding area. Overall, it looks like the side of the battery exploded outward horizontally and sprayed the drivers inner fender and engine area. It's difficult to say if any neutralization steps were taken, but regardless, we will be removing the engine for a rebuild as well as restoration of the engine room. imopar380 - 2019-01-07 8:58 PM This radio differs from the factory radio with plain chrome buttons, has DeSoto style tuning knobs, and the facia is the same as the dash and radio facia in a 1961 Chrysler. Those radio knobs are for 1957-1958 chryslers. I worked at 4242 Roosevelt Way. Been a new car dealer there for decades. Unsure about today, as I have not been to the area for a decade.